This is an incredible age to live in for television enthusiasts. With cable being replaced by wireless and online substitutes like on-demand streaming services, people are exchanging their basic cable setup for services that have more content and cost less. 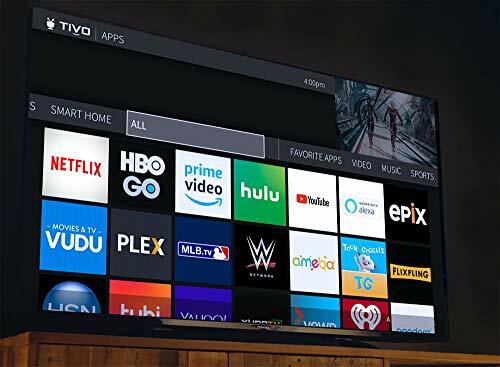 We’ve all heard of the online streaming giants like Hulu, Amazon Prime Video and Netflix, but many of us have been left in the dark about OTA TV tuners and DVRs. What Exactly Does OTA Mean? OTA Vs Cable: What’s The Difference? Why Should I Get OTA Streaming? In this article, I will help you understand the basics of OTA TV: what it means, how to acquire it, what makes it different from cable TV, and what it accomplishes to improve your DVR or streaming experience. The final section of this article will be a review segment where I discuss three great and affordable options for OTA compatible tuner and DVR sets. Anyone of them will help you get started on your new television journey. So, what is OTA? Believe it or not, OTA television has been around for a while but many of us have simply forgotten that it was the standard way we acquired TV signals before the days of cable. OTA stands for “Over the Air” and basically refers to the process of receiving a television broadcaster’s signal through an antenna. 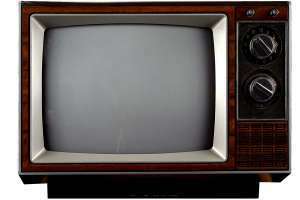 Remember how old television sets had a wired antenna connected to the top of their frames? That is a classic example of what OTA television is, and it still exists. Even when cable became huge in the 2000’s, OTA never went away. Big broadcasters still kept their signal broadcasting towers and they still function to this day. In summary, OTA is the method by which viewers acquire broadcasting signals through an antenna which is then connected to their television set. The reason why cable TV became the dominant force nearly two decades ago is that it simply offered better picture quality while also being more accessible. Good quality TV antennas used to be larger and more expensive. Cable made access to higher picture quality a less cumbersome experience. But cable has one big flaw: it’s pricey. For the amount of content that you get, cable providers simply have not been able to compete with today’s modern alternatives, particularly online streaming. One of the best benefits you’ll instantly notice when switching over to OTA is that there is no cost. You heard me correctly, OTA broadcasts are 100% free of charge. If you are surprised by this fact or find it too good to be true then trust me when I say that you are not alone. Local broadcasting channels have in fact always been free. In the days of cable, we paid a fee for access to multiple channels, but it wasn’t always like that. Cable was always an optional method to improve your television experience. As long as you had a TV, an antenna and a TV tuner, many channels within range were always readily available for no cost. Another difference between OTA broadcasting and cable TV is that OTA doesn’t have as many channels available as cable or satellite. You can think of this as the trade-off for OTA being free. 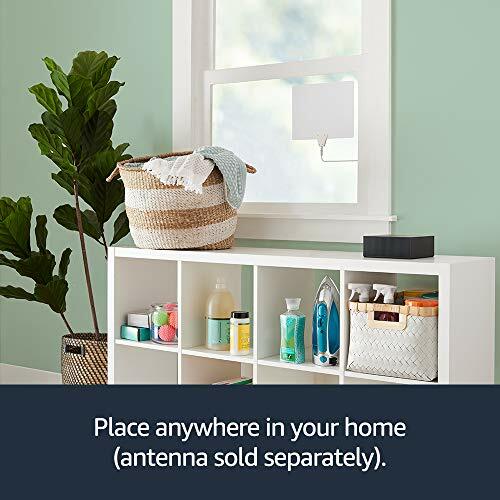 If you have a strong enough antenna then you’ll still be able to get all your local channels and any big broadcasting networks depending on what region you live in. The last difference I want to discuss about OTA vs Cable is technically no longer a difference anymore. OTA used to be received via an analog signal for most of its existence while cable has primarily been digital. Fortunately for us, all of this is no longer the case. Remember when I mentioned something called a “TV tuner” earlier? This is a necessary component in any television service. This applies both to OTA and cable. A TV tuner is a device that receives a signal from your antenna or your cable input and processes it so that it can be displayed as a proper image on your screen. TV tuners used to be for analog signals only, but since around 2007 to 2009, laws were passed to ensure that all television manufacturers include digital TV tuners only. This was to ensure that customers wouldn’t be buying obsolete devices. Everything is transmitted digitally now – not just cable but broadcast OTA as well. This only means good things for the rest of us. As convenient as using services like Netflix, Hulu and others are, none of them offer real-time broadcasting. You can stream a new movie or show the moment it drops online but it still isn’t really the same as watching network broadcasts. Over the air streaming gives you access to what big television broadcasters are putting out. Many people’s biggest gripe with leaving cable is that they no longer have access to whatever big show is currently being weekly serialized. Having an OTA setup to supplement whatever cable-free system you’re using gives you back that ability. Of course, you can also opt to stream from IPTV services that give you the full cable-like experience at a fraction of the cost. You will have to keep in mind that OTA TV isn’t going to offer you every channel on the planet. What you’ll be able to pick up will be entirely dependent on two things: where you live, and what antenna you use. Don’t be put off too hard by the mentioning of “antenna.” Modern day TV antennas are much different than their mid-twentieth century counterparts. They are no longer the large wired sticks that resembled coat hangers. Modern day TV antennas have made huge advancements in terms of technology. Not only are they smaller and easier to place in your home but they have improved signal range. Depending on what model you get, your range will be able to pick up signals from 30 miles away or even 150 miles away. They’re relatively inexpensive as well. Some of the best ones on the market cost only around 40 dollars. What I would recommend next after deciding on a TV antenna is to research the area you live in. Finding out what channels you’ll be able to pick up for free from OTA is very dependent on your location. Many big channels like ABC, PBS, NBC, and Fox have broadcasting towers all over the place. Odds are you’ll be able to find those near you. There are many websites that are dedicated to showing you what towers are near you and can be found easily through search engines, e.g. the FCC DTV Reception Maps. With OTA streaming you’ll also get access to any local news or weather stations, offering the kind of personalized information for your town or city that is hard to find elsewhere. Once you have your antenna and know what towers you have access to, there’s only one remaining step. You’ll have to decide on a digital TV tuner and DVR to complete your setup. As promised earlier in this article, the last section will be a review of three of the best OTA DVR tuners that you can get. 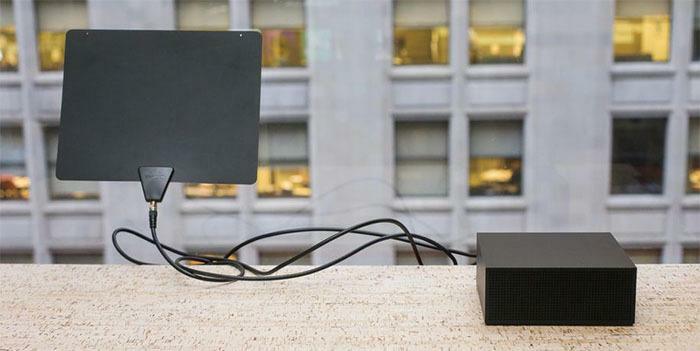 These devices will act as the “middleman” between your antenna and your TV. Right before we dive into the reviews I wanted to share this quick buyer’s guide with you. Many people have never purchased a DVR OTA device (Digital Video Recorder, Over The Air) and aren’t sure what to look for. Just as I’ve guided you through the process and benefits of OTA in general, I’ll now be guiding you through deciding on the best DVR tuner for your needs. If you like recording shows then you’ll want to pay attention to how much storage each device has. DVR devices can store 50 or 100 hours of content for example. The amount of tuners inside each DVR device is also pretty important. You can only connect one tuner to one television and channel at a time. If you have more than one TV in the house then you’ll need the corresponding amount of tuners. This also gives you the very convenient ability to watch one show while you record another from a different channel so you can watch it later. If you have other needs like certain video resolutions or wi-fi connectivity to other devices then there are DVR devices that have these features. 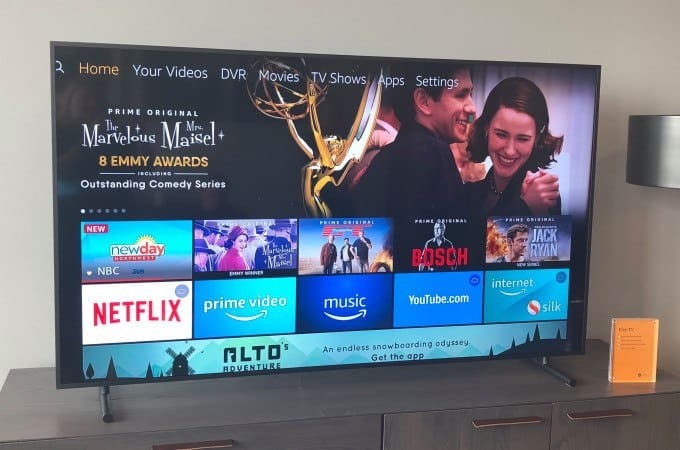 Most OTA programming goes as high as 720p or 1080i but if you wanted to use your DVR box to connect to something like Android TV or Apple TV then you’re in luck with that too. Finally, some OTA DVR tuners combine the live OTA TV streaming with the power and versatility of online streaming services, such as Netflix or Prime Video. This then gives you full access to any content that you may be interested in. Now, let’s look at my three picks for DVR TV tuners that will deliver you the best OTA streaming experience. 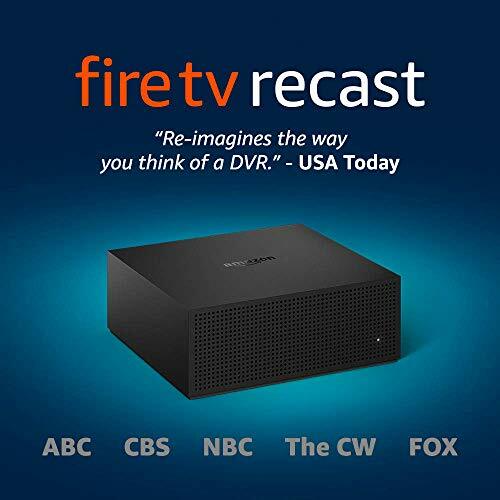 Fire TV Recast is a DVR that lets you watch and record over-the-air TV at home with Fire TV or Echo Show, or on-the-go with a compatible mobile device-with no monthly fees. 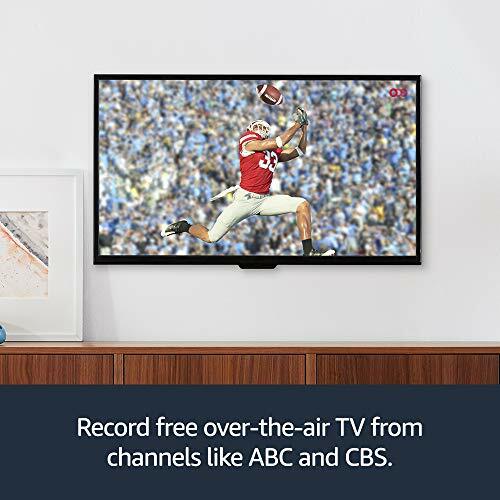 Watch and record live sports, local news, late night shows, and other can't miss TV from channels available through an HD antenna (sold separately) like ABC, CBS, FOX, NBC, PBS, and The CW. First up on my list is Amazon’s very own OTA DVR device that is perfect for pairing with other Fire TV products. The Amazon Fire TV Recast is an easy to setup box that can make OTA streaming a piece of cake. Let’s start with the basic specifications. This DVR device has 500gb of storage which roughly means 75 hours of footage can be recorded and stored on its hard drive. This is a reasonable amount of storage if you plan on removing episodes once you’ve recorded them and have no plans to rewatch them. The Fire TV Recast also comes with 2 tuners which makes it good for watching and recording with the DVR function at the same time. The maximum resolutions are 1080i and 720p which will be enough for the majority of viewers who don’t own 4K screens. 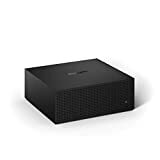 There is also an upgraded version of the Fire TV Recast that comes with double the TV tuners and hard drive storage in case you are really serious about recording multiple shows and channels. When I was unboxing the Fire TV Recast, my first impression was that the device’s build quality is very nice. The outside casing is sturdy and well designed. It feels as smooth as it looks sleek. What was surprising is that it seemed somewhat limited by the ports on the backside of the device. Many DVR devices for OTA streaming feature multiple USB ports, digital optical input for audio and even a slot for extra external storage such as for inputting an SD card. The Fire TV Recast simply comes with the coaxial port for antenna connection, an HDMI port, and an ethernet port, plus one USB port. This probably would satisfy the majority of users but many others may feel there’s a lack of functionality without the other plugs. As far as actually using the device once it’s hooked up to your TV and antenna, everything seems great at first. Initial setup as far as an internet connection or jumping into a program is very quick and easy. Navigating through both channels and the various settings menus of the Fire TV Recast is smooth. This is probably due to the dual-core processor that Amazon installed. I do have qualms with this DVR box but they are all minor ones. One thing that bothered me is that there is no way to specifically select or tune to any particular broadcast. All signals picked up by your antenna will be transferred over fine but you’ll have to scroll through the list of channels if you’re looking for a specific broadcast. It’s also annoying that you can only scroll through the TV guide one hour at a time which came off as very tedious to me. This might be chalked up to how proprietary this device is. The Fire TV Recast can only work with other Fire TV software made by Amazon. The machine doesn’t come with a remote control, believe it or not. I had to use the Amazon Fire TV mobile app on my phone to browse channels and do my initial setup. It’s easy enough to get used to. If you have Alexa or Amazon Fire TV already then you’ll be completely in the clear. It’s compatible with the remote control that comes with Amazon Fire TV Stick and you can use voice-operated controls to perform basic functions. Overall, the Fire TV Recast is a reliable and affordable choice for getting into the world of OTA Streaming. The interface is intuitive and browsing channels is fast. If they could just release a firmware patch that gave us more control over channel navigation then it would really be something. 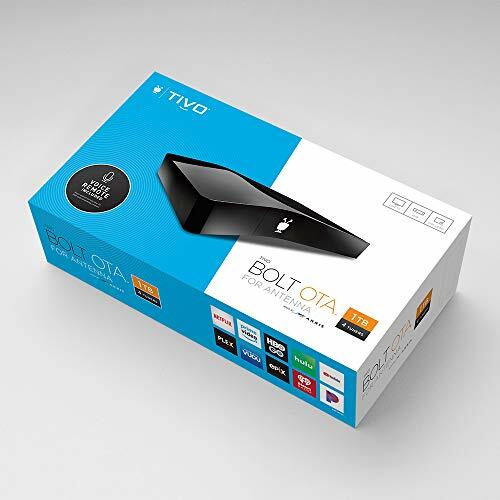 Meet TiVo BOLT OTA for antenna -- designed for true fans of entertainment looking for an alternative to cable TV - the new live, recording and streaming TV device-in-one. Access 4K Ultra HD movies from Netflix, Prime Video, Hulu, YouTube and more. Save time and skip ads with a tap using SkipMode, and find shows faster or zoom through the slow stuff with QuickMode. Next up on my list is the most expensive model I’ll be discussing, but it’s still in the same price range as the others. The TiVo Bolt is a great way to have OTA streaming but also includes the options for access to more premium content. If you love to record as many programs as possible then the TiVo Bolt has you covered. With 1000gb of storage and four TV tuners, you’ll be able to scan and record television shows until your heart is content. I found the setup process to be fairly easy although downloading updates did take quite a while. The Setup Guide that comes included is short and simple. Read it and you’ll have your OTA up and going in no time. As I unboxed the Tivo Bolt I was quite pleased as I was examining the box itself. It has a nice little swerving shape which is easy on the eyes but it manages to stay firmly upright as well. I was especially pleased when I checked the back of the DVR OTA device to be bombarded with all the ports it has. Not only will you be getting your typical HDMI port, an ethernet port, a coaxial port for the TV antenna and a power port, but it comes with many extra plugs. There are two USB slots, which are great for either extra storage or easily moving over any apps you want on a big screen. It also has a digital optical port for high-end audio systems and a regular audio jack. My favorite thing about the TiVo bolt, however, is how easy it is to switch from OTA broadcasts to online streaming services. This device can have Netflix, Hulu, HBO Go, Youtube, Amazon Prime Video and many more installed. Thankfully, navigating through menus is pretty quick which means that this DVR tuner box allows you to switch between OTA and internet streaming very smoothly. It’s a great way to bundle together the best of cable-free TV services. The included remote control is well made as well. The buttons feel fine and I really appreciated the inclusion of a Netflix button. While loading new apps is quick enough, there’s a noticeable delay between pressing a button and the action being registered on screen. They could have opted for better processing power in this case. I noticed as well that occasionally for me the internal fan or machinery would get a little loud, even when powering it off. It’s no deal killer but an unfortunate characteristic nonetheless. Overall I was very satisfied with the TiVo Bolt. The settings menu lets you check signal strengths of OTA sources, and having all the key streaming sites together alongside broadcasting signals really felt like I had a complete OTA streaming experience. Combined with 4K compatibility, this will satisfy the pickiest of TV fans. Cancel cable, keep the DVR: Watch, pause, and record live antenna TV. Browse upcoming shows, schedule and manage recordings. Skip commercials, fast-forward and rewind recordings. 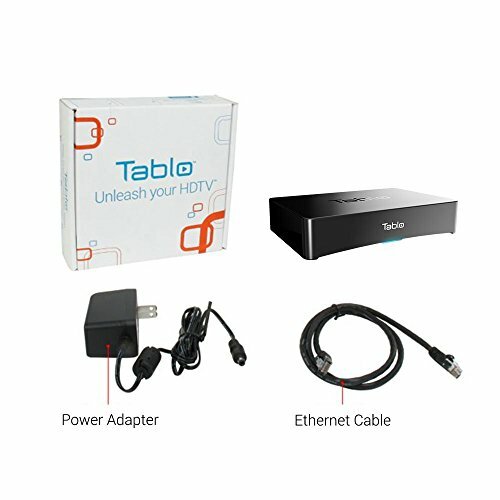 Whole-home networked DVR: Tablo has no HDMI connection. It connects to your router instead of your TV to let you browse, record, and stream live over-the-air (OTA) TV to any device, anytime, anywhere. 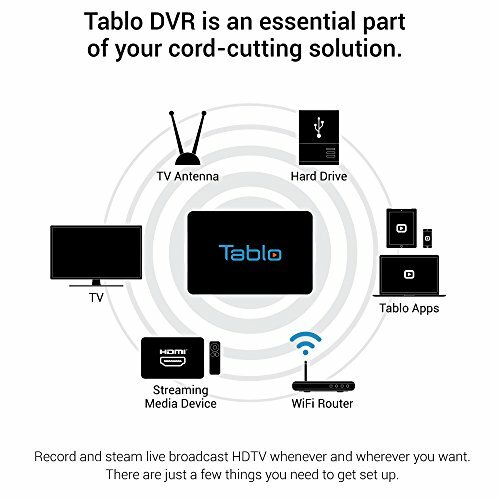 (Out-of-home streaming requires an active Tablo guide data subscription, optional, sold separately). Dual-band AC Wi-Fi included: The only OTA DVR with Wi-Fi, Tablo lets you position the DVR and TV antenna for the best OTA TV signal reception. (TV antenna required, sold separately). The final OTA box I want to talk about is Tablo’s 4-Tuner DVR box. The reason I wanted to showcase this box is that it’s a little different than other DVR OTA boxes in some pretty interesting ways. Let me get them out of the way now. The Tablo 4-Tuner doesn’t have an HDMI port, and it doesn’t have any internal storage. This machine is connected to your router either via ethernet or wi-fi. It doesn’t come with a remote control either so it must be controlled using a Tablo app off of devices like computers, smartphones, tablets, etc. 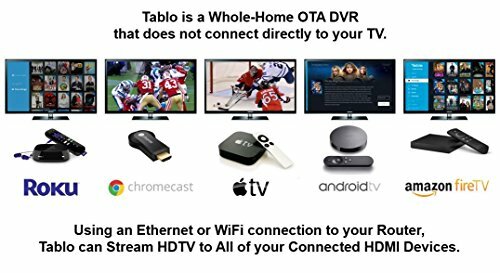 You’ll need either a Smart TV or a dedicated TV box like the Amazon Fire to get the streaming connection established between your screen and the Tablo. Because it has four tuners, you’d be right to expect that it is a great way to DVR anything you want. The problem, of course, is that it has no internal storage. If you want to save any content then you will need to connect hard drives or USB storage devices to the Tablo. It works well if you have enough HDDs lying around, but it’s also a good buy for someone who doesn’t care for DVR and just wants the OTA experience with a high-quality TV tuner. If you want DVR but don’t have the external space, this isn’t the machine for you. I liked the Tablo 4-Tuner DVR because it does an ambitious thing by relying on as much wireless connectivity as possible. This will certainly really appeal to some people. It’s also a lightweight device and consumes very little power compared to other DVR OTA boxes. But if you’re looking for a simpler OTA experience that requires less setup then I can see why this would be a turn-off. The Amazon Fire TV Recast is a great add on if you already own many proprietary Amazon products, and the Tablo 4-Tuner DVR would be a good choice if you have a lot of HDD space lying around and like to have as many devices connected to your OTA machine as possible. But if I had to recommend only one DVR box then I have to pick the TiVo Bolt. It can be used efficiently by anyone: people who are just getting into OTA streaming and by people who have already been doing it for a while. It has solid loading times and a good interface plus a good remote control. Thanks to its simple setup between antenna and TV, and the inclusion of popular streaming apps like Netflix, it simply offers the most complete OTA streaming playback. Thanks for reading my OTA television primer. I hope you’ve learned a lot about this exciting and untapped world of TV viewing.